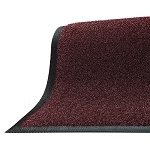 For a tough entrance mat that will scrape away at dirt and moisture with ease, the Brush Hog Plus from Andersen is numero uno. Built with a tufted surface, not only is debris trapped under shoe level in the floor padding, but the fabric borders are drainable for easy daily cleaning. The extra coarse fibers prevent dirt and moisture from entering the building and create a safe walking surface at the same time. Built for durability, reinforced rubber nubs are built into the Andersen BrushHog Plus to resist damage in high traffic areas, maintaining performance and ensuring a long product life span. 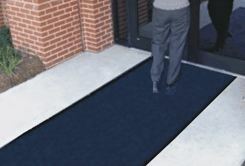 A gripped rubber backing on the entrance matting helps control its movement, decreasing the chance of slip damage and hazards. Available in four different colors, this attractive Brush Hog Plus will match many types of décor and interiors.